The last 17 years have been quite the ride for Northern Irish wing wizard Wayne Carlisle. And the genial, engaging Truro City assistant talks me through a playing career which began at the lofty heights of a packed Selhurst Park and ended with a bittersweet mixture of triumph and early retirement at picturesque Plainmoor. But Wayne’s journey has been about much more than his performances at 3pm on a Saturday. There have, of course, been back-to-back promotions to the Football League, with Exeter City and Torquay United. A dramatic end-of-season run which somehow preserved Bristol Rovers’ (then) unbroken run of 83 years in the league. And, of course, success as Steve Tully’s right-hand man at Truro City. But Wayne has also been coaching the next generation of players to succeed, whether in the beautiful game or in the world of business. Here is his story. DB: You joined your first club, Crystal Palace as a teenage trainee. How difficult was it leaving your home in Lisburn, Northern Ireland to join the Eagles? And what are your earliest memories of life at the club? WC: At 15-years-old, I didn’t find it tough at all. I didn’t look at it in that way, I saw it through a child’s eyes. I was just excited to have the opportunity to play professional football. Looking back on it now I have my own children, and work with children, for someone at that age, moving was a big thing. I went into digs with another Irish lad named Kieran Loughran, and we lived together for about three years, so having that company made it a lot easier. And I was a young lad, training every day, and it was all I had ever dreamt of doing. It was a brilliant experience. A Portrait of the Artist as a Young Man: Wayne in his Palace days. DB: Your league debut at Palace came against Birmingham City in February 1999, and you became a regular fixture in midfield. What do you remember about your debut? And what was it like playing and training with established stars like Atillio Lombardo and Saša Ćurčić? WC: On my debut? I just remember the noise. Walking onto the pitch, having never played in front of so many people before, that was memorable. As soon as any game kicks off, you’re into the action and you play automatically from your habits in training. I think I took training with that calibre of player for granted. I was used to it from an early age and assumed that it was just normal. But in retrospect, it was a really big deal and a privilege to get to work alongside people of that quality. I definitely tried to learn from them, though. Atillio Lombardo was especially helpful. Obviously, he played the same role [winger] as me, and he would spend time talking me through things – via his interpreter, most of the time! We discussed topics like good positioning, different types of crosses and how to best use them, so he was particularly helpful. DB: Scoring a first senior goal is a special moment for any player. Yours came in October of that year, in a 4-0 drubbing of Portsmouth. What was that moment like? WC: That was pretty special. As I remember, the ball was on the edge of the box, and I just worked off instinct and hit it on the half-volley. Luckily enough it found its way into the net. It’s a cliché, but, you can’t describe it. It is the best feeling in the world at that age. Experiencing that was a real buzz. I didn’t have a celebration planned, though. I wasn’t really that type. Whatever I did to celebrate – I can’t remember exactly – I’m sure it was pretty boring! Not up to the standard you see nowadays! DB: Palace at that time were a club who went through managers pretty quickly. You played under the likes of Terry Venables, Steve Coppell, Alan Smith and Steve Bruce. Who got the best out of you as a player, and why? WC: My best time at Palace was under Steve Coppell. He was another winger like me, so he was great in giving me individual support about that role, and was not demanding of me. He understood that I was young and finding my feet, and let me develop at a rate which was right for me, without putting me under any pressure. Those other managers were more focused on results. Obviously, Steve [Coppell] wanted good results too, but they were more demanding. As a 19-year-old, I maybe wasn’t ready for that kind of pressure. For me personally, Steve [Coppell] was the best man-manager of the bunch. DB: You joined Division Two side Swindon Town on loan in the following season, and were an important part of helping the side to a respectable mid-table finish. Did you enjoy your time at the County Ground, and were you keen to head out on loan? WC: I loved my time there, actually. I was getting guaranteed first-team football at Swindon, and we were playing in front of decent crowds at a good standard. As a team, we were having a fairly successful spell, as well. At the end of my loan, I actually tried to extend it, but the Palace manager had changed from Steve Bruce to Trevor Francis. He decided to recall all of Palace’s loan players back, to have a look at them. Going out on loan was something both I and Palace were keen on. I had been used to first-team football at a young age, and wanted that feeling of training all week and playing on a Saturday. I was desperate to have that again, and the club thought it would be a good idea for me. 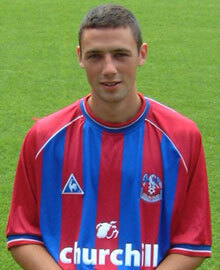 DB: In March 2002, you made a permanent switch to Bristol Rovers. In your first full season, the club avoided relegation from the Football League by just 3 points, winning 3 of their last 4 games to survive. What was that nervy run-in like? WC: That was really tough. We had signed a lot of very good players that season, and for some reason, the team just didn’t click. We had so much quality in the squad, so in the latter part of the season, the players were just looking at each other thinking ‘we really shouldn’t be in this situation’. We signed Andy Rammell partway through the season, and he was a hugely important addition and scored some crucial goals [including 4 in those final three games]. I pitched in with some goals myself, and we survived. But it wasn’t enjoyable, and certainly not a situation which a club of Bristol Rovers’ stature should have been involved in. Wayne was vital to Rovers’ survival in 2002-03. DB: In the following campaign, you notched an impressive 8 goals from midfield, and provided the service that helped striker Giuliano Grazioli reach double figures. Do you think that was one of your best seasons in the game? WC: I was certainly productive that season, and I did my job well, so it was one of my best years in a personal sense. Rovers’ manager at that time was Ray Graydon – another right winger, funnily enough! So again, he was a manager with a good understanding of what was needed from me, and I fit into his style of play. That obviously made it a lot easier for me to have a successful season. DB: You joined Martin Ling’s Orient revolution from Rovers, and played in the first half of the Promotion season of 2005-06, before you were sold to Conference Premier club Exeter City. Do you feel proud to have been part of Orient’s success, or were you unhappy at having missed out on that end-of-season glory? WC: No, I wasn’t unhappy about it. I played my part in Orient’s season, and obviously whilst I would have liked to have been there to celebrate at the end, the move to Exeter was a mutual decision. Exeter were looking for someone in my position, and I had worked with [then City manager] Alex Inglethorpe at Leyton Orient previously. He said he wanted to take me down there, and as I wasn’t getting guaranteed regular games at Orient at that time, I thought the move would be worthwhile. I wished them all the best, and off I went. And I was just proud of what I achieved in the early days. I left the O’s on good terms. I actually went back and trained with Martin after breaking my leg, before I rejoined Exeter [in October 2006]. It was actually Paul Tisdale who re-signed me there! DB: Your time at St. James’ Park was certainly a successful one. The Grecians reached the Playoffs twice and were promoted to the Football League in 2008, thanks largely to your crucial strikes against Torquay United in the Semi-Finals. Did that feel extra special after what happened with Orient? WC: Yes, to an extent. However, Orient’s promotion was not something I was especially conscious of missing out on because I had still played a part in it. The nature of football is also that players move on. It was nice to see the journey through with Exeter. Especially so as we had come very close in my first season with the club, losing the final at Wembley [to Morecambe]. DB: What was Paul Tisdale like to play under? WC: Paul is a fantastic gaffer and an especially good man-manager. He understood the players well as individuals and took the time to get to know us. I had a very good relationship with him. 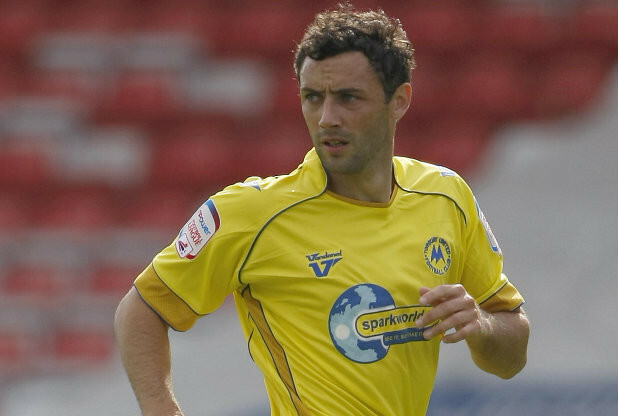 DB: You repeated the Conference promotion feat the following season with none other than Torquay United, but retired less than a year later, in January 2010. Were injuries, or a new career path the main reason behind retiring at age 30? WC: It was a combination of both. I had damaged ligaments in my knee, around Christmastime [of 2009]. The medical advice I received was that the injury was going to seriously inhibit my days of playing football, in the near future. At that point, a job had become available, teaching the game in a college. I had taken on board the advice of the specialist who warned that the injury would stop me playing at Conference level, at some point. The game usually spits people out, and I didn’t want that to happen to me. When the opportunity of this college role came about, I decided to leave on my own terms, and in my own way. Wayne in action for the Gulls during his promotion-winning stint. DB: Outside of the game, you are still Director of Football at Ivybridge Community College in Devon, and have had the likes of Paul Scholes running a session, as part of your initiative to improve the school’s football academy. So what are the essential things that you think young players need to know about the game? WC: They need to understand how the game functions. So they need to realise how invasion games work. Game understanding is a key thing. It is something which the top players possess, and a lot of younger players don’t have. Work ethic is also crucial, as is a passion for actually playing football. Players also need to take on information and apply what they have learnt in training and matches as well. But what we try to do at the college is not just about developing footballers. We actually look to develop people. They get strong values from us, so that whether they are in football or business, or whatever route they take in the future, those individuals will have the skills to make a positive contribution. DB: In 2011, you returned to play a handful of games for Truro City, and you must have liked the place, as you came back to Treyew Road three years later as Assistant Manager to Steve Tully. How did the move come about? And what was it about Truro City that made this the right club for you? WC: When I first took the job, I wasn’t sure it was right for me to be honest! I had seen my pathway after playing as working in youth football. Working with players in that development phase is something I really enjoy. 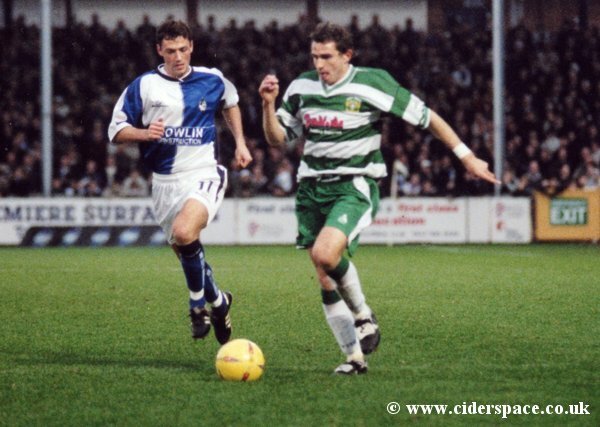 The Truro City position came up when Steve Tully – who I had played with at Exeter – contacted me. He said the job had come up and asked if I’d be interested. My initial response was ‘not really’! I didn’t think this role was part of my journey, but Steve convinced me to go along and stand with him on a Saturday. And I had to be honest with him, I enjoyed it! It’s a role I’ve been happy with ever since, and the club has had some real success, which has tied me to it. Being involved in senior football again has also reignited that competitiveness in me. You kind of lose that when you work in the development phase, because the aim is to develop players in the long-term, and winning a game on a Saturday is not a major focus. You don’t experience those positive short-term results. Having played football for 12 years professionally, that competitive spirit is always in me somewhere. It doesn’t just disappear. Joining Truro gave me the opportunity to ignite that fire again and gave me that spark that I had probably missed. DB: You and Steve have proved a formidable team, winning promotion from the Southern Premier Division last season, defeating St. Neots Town in the final. But how do you two differ in your approach, tactically and as man-managers? WC: We both have our different views on the game, but we’re also pragmatic about our approach. Steve and I both have an idea of how we would like the team to play, but we realise that sometimes our circumstances and the level we’re working at means that can’t always be translated onto the pitch. But we don’t let ourselves get bogged down by that because the aim is to win games of football. I think part of the reason we’ve been a successful partnership at Truro is a willingness to sacrifice a bit on our ideals of how we think football should ideally be played. Giving his players some vital instructions as Truro assistant. DB: That’s fascinating. So how do you think the way Truro line up differs from how you would play ideally? WC: We line up to compete with the opposition, first and foremost. Tactically, we set about trying to disrupt their game, and as the match goes on, start to impose how we want to play on them. The pitches at this level dictate what we can do, somewhat. We’d like to ask our players to play the ball out from the back and through midfield, but that isn’t always going to be possible. Sometimes we have to be more direct than our ideal style would be, and on occasion, we’re required to be a more physical side as well. Those things are dictated by the opposition, the level and the pitches we’re working on. DB: The success Truro City have experienced with you in the dugout is bound to mean that your stock is high. Is the long-term aim to take on a manager’s job within Non-League, or do you prefer the assistant role and having the work at Ivybridge? WC: No, that isn’t my aim. Steve [Tully] does all the man-management work, and dealing with the agents – things in that area. I just enjoy being out on the grass with the players, coaching them. I like watching our opposition and coming up with tactical plans. Those are the aspects I’m happy doing, so I don’t think I could see myself going into management. Then again, I hadn’t seen being an assistant manager in adult football as part of my career path. So I could never say never, but it would take a lot to get me off the training pitch and away from spending that time teaching players. It’s what I love doing – at any age group and any level. DB: What do you enjoy doing outside of football? And was there ever a career you considered, aside from playing the beautiful game? I enjoy being with my family. I have two young boys, and I love spending time with them. They’re my release from football. With regards to a career outside of football, I wouldn’t have a clue what else to do! It’s been my life since I was 15, and had been all I ever dreamt of doing as a little lad kicking around in Northern Ireland. I feel privileged and proud to have made a career in the game, but I never had any other occupation in my head, and still don’t. Thank you to Wayne for his superb insights into a fascinating life in football. Best of luck to Wayne and everyone at Truro City for the rest of the season. You can follow Wayne on Twitter, as well as Ivybridge Football Academy, whose website can also be found here. All images are accredited in the ‘Description’ section for the photos. Posted on February 20, 2016, in Dave Burin Interviews, UTL Archive, Vanarama NL South and tagged Bristol Rovers, Crystal Palace, Exeter City, Featured, Interviews, Leyton Orient, National League South, Non-League, Torquay United, Truro City, Wayne Carlisle. Bookmark the permalink. Leave a comment.